Porchetta is a savory, fatty, and moist boneless pork roast of Italian culinary tradition. The body of the pig is gutted, deboned, arranged carefully with layers of stuffing, meat, fat, and skin, then rolled, spitted, and roasted, traditionally over wood. Porchetta is usually heavily salted in addition to being stuffed with garlic, rosemary, fennel, or other herbs, often wild. Although popular in the whole country, porchetta originated in central Italy, with Ariccia (in the Province of Rome) being the town most closely associated with it. Elsewhere, it is considered a celebratory dish. Across Italy it is usually sold by pitchmen with their typically white-painted vans, especially during public displays or holidays, and it can be served in a panino. It is also eaten as a meat dish in many households or as part of a picnic. 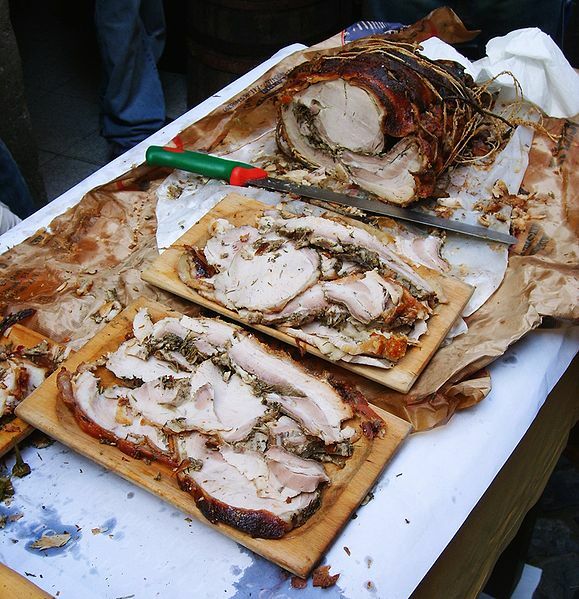 Porchetta is one of two iconic culinary products of the Lazio region, the other being the sheep cheese pecorino romano. Serves: 12 to 15 servings. Slice the roast and serve with the sauce.